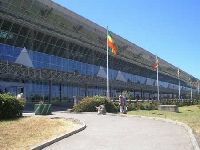 This is a new area expanding to the southeast of the city centre and is a favourite with high-income Ethiopians and the international community; many diplomatic missions and aid agencies are located here. Housing is mostly in new-build houses or slightly older bungalows in leafy, gated compounds; apartments are in limited supply. Bole Road running southeast from Meskel Square to the airport boasts an excellent selection of shops, supermarkets and fashionable new bars, pubs and eateries, including the landmark Dembel City Center the one and only complete shopping center in Ethiopia offering over 100 shops, a snack bar and restaurant and an underground carpark for 500 vehicles. The area is well served by buses, minibuses and taxis; it is also bordered by the ring road. Away from the main roads it is quiet and there is plenty of space, in stark contrast to the older and more densely populated areas of the city to the north and west. At the centre of Bole on the West Bole Road stands the newly built Bole Medhane Alem cathedral (Ethiopian Orthodox), reputedly the largest church in Addis Ababa and the second largest in Africa, surrounded by (currently) open land a veritable cathedral in the desert. Further north, around Haile Gebreselassie Road (formerly Asmara Road, and renamed after Ethiopias most popular long-distance runner), lies Boles downmarket sister Urael, a quiet residential area populated by a mix of middle- and low-income groups living in a variety of housing of old and newer build.